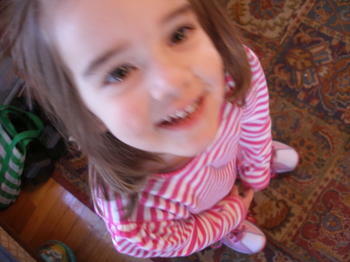 It’s always amusing to me how my children hit the ground running in the morning. I’m still groggy over my cup of tea and Mary is already in a pair of pink roller skates that are about five sizes too big, "skating" around the carpet, pausing only to give the cat, asleep on the sofa, lessons on how to skate. 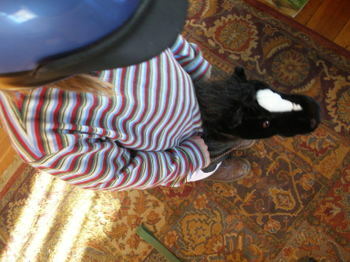 Emma is dressed in her helmet and riding shoes, straddling her horse, and on her way out the door for a "big show". Yesterday she had me fill her horse with stuffing and stitch it closed. She told me she didn’t like puppets and how floppy his head was. I almost called my sister–a vet technician– for proper stitching technique as I sat in my chair and closed up the open "wound" on the horse’s underbelly. But…hallelujah, we are all pretty much healthy. We have come back from the land of ginger ale and saltine crackers. Everyone got the bug, except for me. Emma had it the worst of all, as it hung on for more than 48 hours. I set up a station on my kitchen counter full of "easy on the tummy" foods–flat coke, ginger ale, saltines, pretzel sticks, soft-boiled eggs and jello. It was a long week, but we’re through it. Today I’m headed back to the fabric store to pick up some yardage of the brown flowered fabric. I’ve decided to go ahead and give the bumper cover a shot. As much as I’d like everything to be fresh and new and perfect for this baby, our budget is requiring me to mostly pull together the things we already have, adding a few small, new touches here and there–painted walls, new curtains (the red fabric from IKEA), etc. Dan finished painting the room this weekend in the grey-blue (on the right in the color card above), and painting the crib in the creamy white peeking through behind it. This week he’s going to make me a set of the pegs like the ones in the picture below. I’ve always wanted a set of these in a baby room. (any and all rooms actually…) It is nice having a handy husband. So, I’m obviously nesting…exactly four weeks away from my due date, which according to my doctor will be the latest I’ll deliver. Because of the meds I’m taking, an inducement is in my future. I’ll keep you posted on the bumper project. 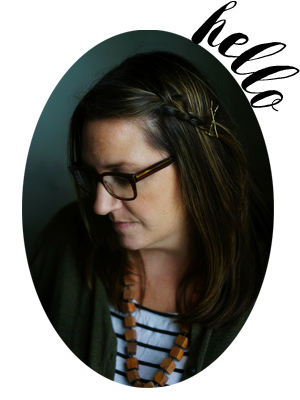 But first I need to go back and read all your comments to give myself a little bumper pep-talk…. Glad everyone is healthy again! Wishing you peace and productivity for the next 4 weeks. So glad everyone is feeling better. Handy husbands are the BEST!! I’m so happy everyone’s on the mend! Can’t wait to see the grey-blue walls with the creamy crib. It sounds just beautiful. Yay for everyone being better! oh you are so wonderfully crafty you will have no problem at all!!! The baby stuff looks so great. It’s so awesome your husband is a carpenter too! I LOVE pegs, but only have a few by my front door. very cool. So glad you are all feeling better. 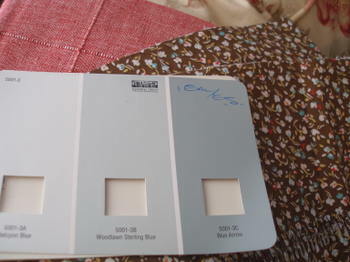 Love the paint colors you chose for Baby 3’s room. I bet your bumper cover will be beautiful! Hope this helps, especially if recovering the one you have doesn’t work out. Also, I’m glad you all are feeling better. I can tell you that having a peg rail is fantastic in a nursery. We hang all kinds of stuff on it while doing diaper changes (socks, pajamas, even shoes). 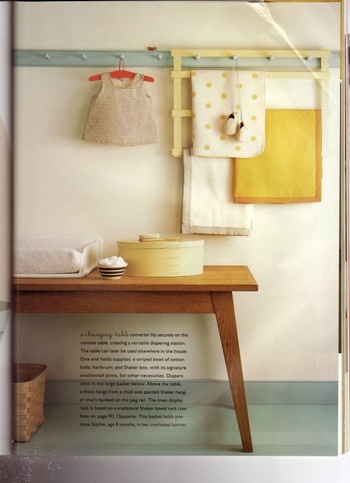 I love that photo with the peg rail.Wish I had a handy husband! Your nesting all sounds so lovely – as do your words/pictures of the girls’ bustling and activities this morning…. so sweet! Glad your family is through the ickyness before the newest member of your family arrives. oh the pegs! i love them…. makes me wonder where they’d go in my house. hmmm. Hurrah! Everyone is on the mend! Thinking of all those baby things makes me a little wistful as I am preparing to sell lots of my baby stuff in this spring’s garage sale! Take care of yourself & enjoy some quiet & sleep time while you can! the set of pegs is a wonderful idea!! i am so happy to hear that you are all healthy! the bumper cover will be a piece of cake – can’t wait to see it. How much do I miss Martha Stewart Baby? sigh. the last one came out before I was even pregnant with my babe. And now we don’t even have MS Kids! Best of luck with the next month! Glad you’re all on the mend and that mummy (er that would be you) is no longer Head Matron. Hope you get some rest over the next few weeks – you will need it! How exciting to meet your new bundle so soon! Oh and babies don’t care if everything’s brand new or not! I’m so glad you’re all better. You never got it? Wow. Although my mother swears that mother nature is looking out for moms, cause I usually seem to miss the worst bugs that pass through here. Skates and horses early in the morning must mean everyone’s feeling better. What a relief to hear it. How exciting to be working on the baby’s room! I think recycling things makes them special so keep at it.